Reserveren voor ons tuinterras kan alleen door telefonisch te reserveren. 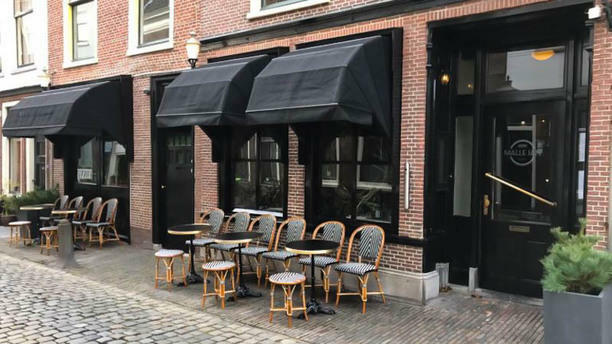 A cozy French bistro in the heart of Leiden. In the French ambiance of Bistro Malle Jan you feel like you're on vacation. You can enjoy here a daily changing 'plat du jour'. For small prices. Or relax with friends or family and choose a delicious dinner. Pork tenderloin, sea bass and seasonal vegetable quiche, there’s something for everyone. And do you visit on Sunday? Then there is also live jazz music. Good food, good service, good night. Lovely! Great food, atmosphere and service and not at all pretentious! Super gezelig! It is over 20 years since we last ate at Malle Jan. The starters (fish carpaccio, blue cheese salad) were both delicious but too large so the mains (red mullet filets, lemon chicken), although tasty, weren't appreciated as much as they might have been. As a result there was no room for a dessert! The wine. a Viognier, was served at the correct temperature and complemented the food well. Food is great, We had a table downstairs and the ambience was really nice. Excellent service! Very enjoyable meal with Husband and grown up daughter here to check out University. Lovely well cooked food delicious onion soup we all enjoyed our meal and two glasses of wine for a reasonable price. Would definitely go back. All the food was spicy, which me and rest adults liked BUT we were also with kids. As the only choice from the menu for the kids were some fries we chose to order for them hamburgers. The waiter understood very well that the hamburgers were for the kids and he didn't say a word that they are so spicy/hot/chilly. And of course kids couldn't eat at all. We manage somehow to feed them with our food and when afterwards we told the waiter that he should worn, he was arrogant enough to tell that this is our fault, that we order not from kid's menu ! Otherwise we like the Bistro, the atmosphere, the food, everything, just now we know - it is not child-friendly. Always pleasant. Foreign friends insist on spare ribs at Malle Jan every time they visit Leiden. Good choice. Très joli cadre. Mets exceptionnel. Agneau, blanquette, couscous et fondant au chocolat délicieux! Really lovely dinner. The three course menus are an excellent value.